Boating – Our retirement living community has a 55-slip marina that provides direct access to Lake Griffin. We also offer a boat launching ramp if you prefer to keep your boat in our dry storage area. Fishing – We have an on-site pier that provides the perfect spot for fishing Lake Griffin’s renowned trophy largemouth bass. Swimming – Whether you prefer taking a dip in the waters of the Atlantic Ocean or treading water in a pool, you’ll have plenty of opportunities for swimming. 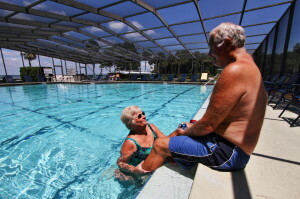 Our retirement living community has a heated and screened pool, and Leesburg, FL, is just a short drive away from sandy beaches. Plus, there are also plenty of activities to enjoy on dry land. You can shoot pool in the billiards room, work up a sweat in the fitness center, play bocce ball or shuffleboard on the courts, and even take a spin on the dance floor. No matter your hobbies, you’ll make fast friends with neighbors who share similar interests. Our retirement living community is extremely close knit and residents truly enjoy each other’s company. With a prime location and so many amazing amenities, Lake Griffin Harbor might seem like a pricey place to call home. However, our 55+ community is surprisingly affordable. All amenities and maintenance of common areas are included in one low monthly homesite lease payment, and our manufactured retirement homes are very economically priced. To learn more about Lake Griffin Harbor and what sets us apart from other retirement living communities in the Leesburg, Florida, area, contact us today. One of our friendly lifestyle consultants will be happy to answer your questions.